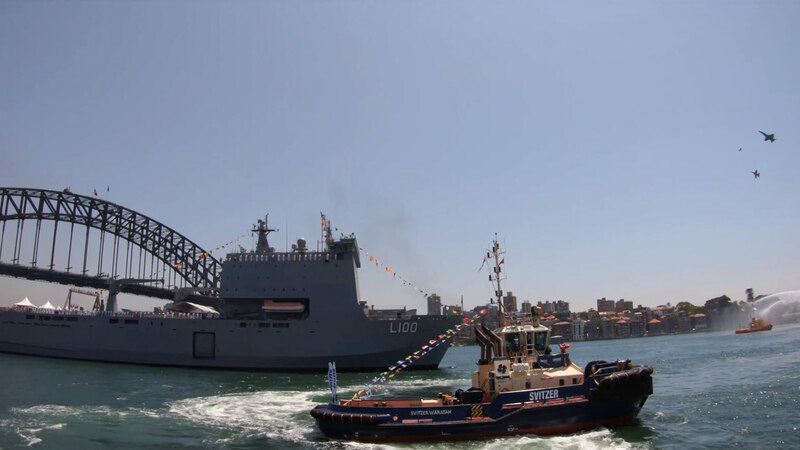 See how we celebrated Australia Day 2019 on Sydney Harbour with our port community by taking part in the annual Tug and Yacht Ballet! Performed to the soundtrack of “In the Hall of the Mountain King” by Edvard Grieg, this fantastic event captivated the expected 65,000 strong audience and was highlighted by jets, yachts, tugs, ferries, a live orchestra, 350 voice choir and fireworks! There are two tugboats performing today – Svitzer Bondi and Svitzer Waratah. Svitzer Bondi calls Sydney Harbour or Port Jackson home assisting vessels including cruise ships, tankers and bulk vessels calling the harbour every day and completing almost 500 jobs a year. Despite its size, Svitzer Bondi is capable of pulling a 100,000 tonne vessel, such as the cruise ships we see moored in the harbour today. Instead of traditional rudders and a steering wheel, both Svitzer Bondi or Svitzer Waratah have twin joysticks, one for each side of the tugboat, controlling two massive 1500 kilowatt engines which revolve independently at 48,000 revolutions per minute. This is what gives these tugs their immense power and manoeuvrability. and a deckhand, who is responsible for the tugs presentation, attaching the line to vessels and deck maintenance. A special plasma line, originally developed for space operations, connects the tugboats to the massive ships they are moving into and out of ports. It has a braking strain of 200,000 tonne. At 500 tonnes, Svitzer Waratah is a slightly bigger boat than the Bondi and is equipped with a water cannon for firefighting. She is 28-metres in length and 10-metres wide. She was named by Svitzer crew for the NSW state emblem and is kept busy at her home port in Port Botany. In 2018, Svitzer Waratah completed more than 1110 jobs, bringing tankers and container vessels to port. Svitzer also plays a crucial role in emergency response, aiding stricken vessels or battling blazes onboard ships if required. The water canon on board Svitzer Waratah can pump out 2,000 litres of water per minute and can spray a distance of 100 metres.